Racing Victoria have finalised their schedule for the 2017/18 season. We take a look at the metro race dates. Racing Victoria this week released their 2017/18 race dates with some interesting changes for the new season. There’s once again 557 race meetings for the season starting August 1st, across 67 tracks state-wide. We’ve taken a look here at the metro racing schedule, which is where our Victorian professional Trevor Lawson focuses his action. There’ll be 109 metro race meetings in Victoria next season. – The major initiative for the new season is the introduction of Wednesday twilight meetings. Victoria is trialling race-free Mondays for a ten-week period from January to March, with those meetings being transferred to Wednesday twilight. Seven of the ten twilight meetings will be metro: one at Caulfield to kick things off on January 17th, and six at Sandown. The remaining three twilight meetings will be regional meetings at Bendigo and Ballarat. – Twilight meetings will start at 3:45pm and run until around 8pm, a friendlier timeslot for those with work commitments than the traditional Wednesday metro meeting. – These changes mean that just 28 of the 109 metro meetings will be held in traditional weekday slots, with the rest taking place on weekends, public holidays, Friday nights or Wednesday twilight. 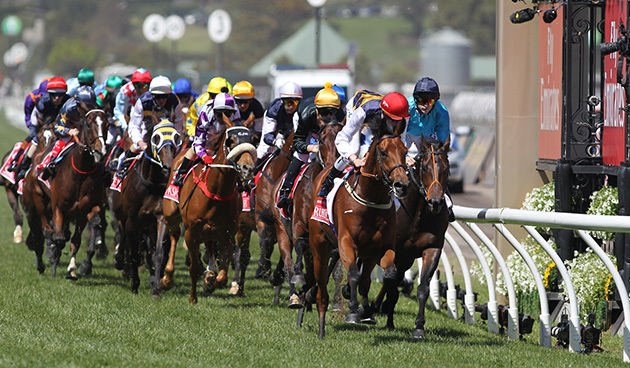 – Aside from the four tracks in Melbourne, metro-class meetings will again be held at Ballarat (Ballarat Cup), Bendigo (Golden Mile), Pakenham (Pakenham Cup) and Mornington (Grand Final Day, Mornington Cup and three midweek meetings). – The AFL Grand Final returns to the traditional last Saturday in September, which means the Turnbull Stakes meeting at Flemington gets its Saturday status back the following week. The Grand Final now clashes with Caulfield’s Underwood Stakes meeting, which has been moved to the Sunday. – The Victorian public holiday on Grand Final Eve will play host to the launch of Moonee Valley’s Friday Night season, featuring the Moir Stakes. The regional Benalla Cup will be run during the day. – Two Flemington meetings have been removed in December to give the track a seven week break between the Melbourne Cup Carnival and New Year’s Day. This break will allow the VRC to undertake significant work on the track in the wake of surface issues over the past year or two. Caulfield track manager Jason Kerr recently spoke to us on the Betting 360 podcast about the importance of these breaks when preparing tracks for racing. A two-day Wangaratta Cup Carnival (Saturday March 3 – Sunday March 4). A two-day Mildura Cup Carnival (Friday July 27 – Saturday July 28). The return of the Echuca Cup from May to March. The move of the Tatura Cup from March to Saturday September 23rd. A new non-TAB meeting at Cranbourne on Melbourne Cup Day. 109 metro meetings for the new season makes a twelve month subscription to Trevor Lawson’s Melbourne Ratings just $20 a meeting – incredible value for access to all the early bets, rated prices, speed maps, race commentary and recommended betting approaches of a proven winning professional punter. Monthly, quarterly and Saturday-only memberships are also available.